I love breakfast, but I usually fail when it comes to making elaborate ones. I love the idea of taking the time to make it – but in practise usually end up hastily blending a smoothie as I run out the door. I have grand dreams of granola and pancakes but they don’t often happen. 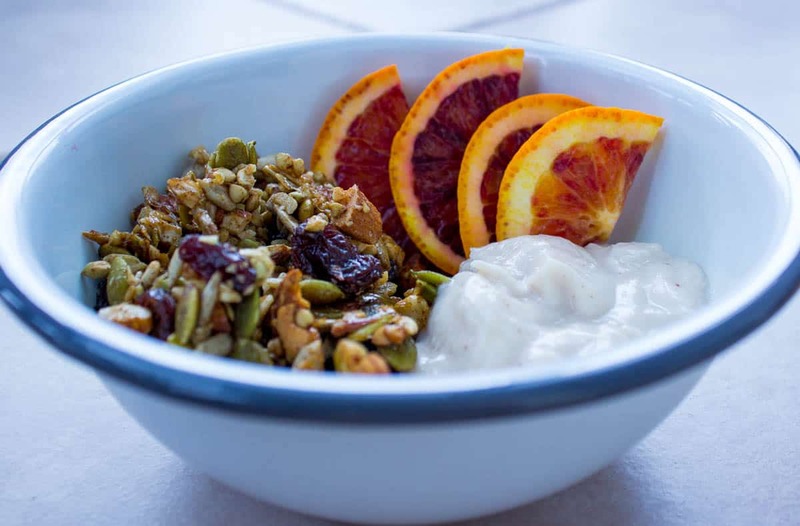 Not so with this Spiced Orange Maple Granola! It takes 30 minutes to make and you can bake a batch in advance to keep you going for the week. I tend to eat it as more of a treat breakfast as it’s a little too sweet for my tastes first thing in the morning, but it also makes a great snack or mid-morning pick-me-up. Thanks to the mix of orange oil and spices, this breakfast will make your kitchen smell like Christmas in a bowl, and tastes just as good. It’s a mix of proteins, complex carbohydrates and good fats, with a small amount of natural sugar – all of which should mean your blood sugar levels don’t crash after eating it! Pulse the cashews and almonds very briefly in a blender until they are chopped. Add them to a large mixing bowl, along with the pumpkin seeds, sunflower seeds, buckwheat groats, raisins, cinnamon, cloves, orange oil, maple syrup and salt. Mix well with a spoon until all ingredients are combined. 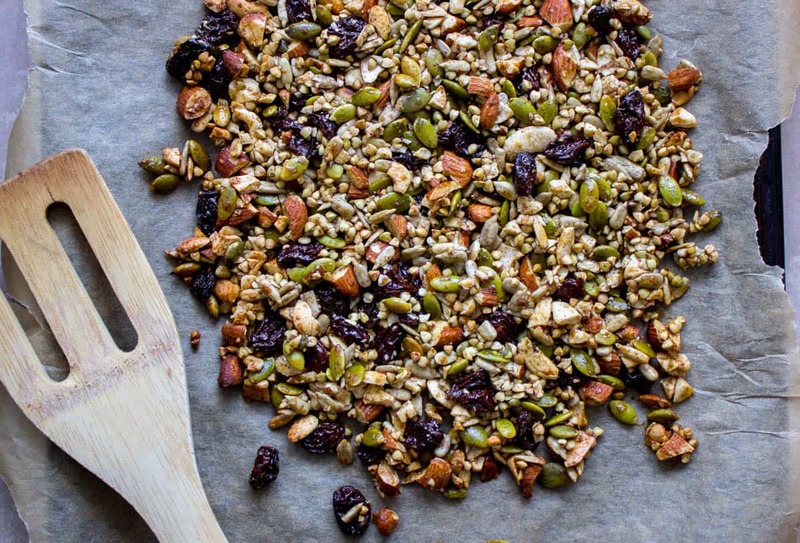 Spread the granola on a baking sheet lined with parchment paper and bake in the oven for approximately 15-20 minutes, until the granola is just starting to brown. Remove from the oven and allow to cool, before breaking it into pieces. To serve, place ⅔ cup of granola into a bowl. Add ½ cup of your chosen yoghurt and garnish with orange slices. Drizzle over some maple syrup to finish and you’re good to go! The granola will be good for up to a week if stored in an airtight container.